Ontario Knife Company has been manufacturing knives for over 100 years, and while they may not be alone in that distinction, their ability to shift focus and adapt to the changing demands of the modern knife owner has been spot on. Their most popular and visible line of products has been made in conjunction with Randall’s Adventure Training (RAT), with lead designer Jeff Randall. While primarily composed of fixed blade knives, there are a couple of folding gems to be found in the RAT Model I and my favorite the RAT Model II (aka RAT 2). The RAT 1 was designed first and foremost to be a sturdy, hard-use knife that can take a beating, and it does that with flying colors. But for those of us who prefer a more slimline, lightweight pocket knife, Ontario offers the RAT 2, a scaled down version of the RAT 1. In short, the RAT 2 features all of the great ergonomics, materials, and action of the original, packed into a size that’s friendly to pockets. The RAT 2 hits the sweet spot of simple but effective knife design with it’s 3-inch blade, 7-inch length and all coming in under 3 ounces. 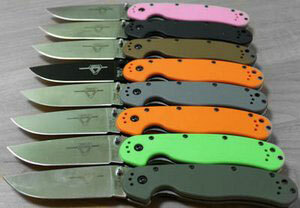 The RAT 2 features a classic gentle drop point style blade, and it fits so well on such a utilitarian knife. The design philosophy of Jeff Randall is all about use in the field, and whether that entails something as intensive as cleaning game or making feather sticks, or something as simple as cutting cordage for a shelter, the drop point blade was made for it. The choice to produce the blade with a full flat grind also lends to its simple and useful aesthetic, increasing its slicing ability and making field sharpening a walk in the park. Speaking of field sharpening, I absolutely breezed through putting an edge back on this knife thanks to the AUS-8 steel, which can take a razor edge with minimal effort, and hold it fairly well. The AUS line of steels are manufactured in Japan and shipped worldwide to a number of popular knife making companies, with AUS-8 being the most popular these days. What that means to most consumers is a wildly different experience depending on who’s producing the knife, owing to the differences between how they choose to heat treat the steel. I have no issue saying this, however; Ontario has easily the best AUS-8 blade I have ever used, thanks to the fantastic job they do of heat treating this material to around 59 HRC. While the AUS-8 steel is no match for some of the more popular premium steels like S30V or even 154CM, it does have its advantages in the ease of sharpening, impressive resistance to corrosion, and of course price. N oryl GTX, Valox, Nylon 6, Thermoplastic… call it what you will, knife making companies have embraced plastic as a handle scale material for its weight saving and, let’s be honest, cost saving benefits. While I may not be wild about the material, I am pleased to say that the RAT 2 handle scales feel the least “plasticy” of the bunch. Ontario Knife Company uses a very pleasing micro-checkered pattern that almost feels like a denim micarta in the hand, and does a fair job of creating enough texture to keep the handle grippy while not ruining your pants like rough G10 can. On the design side, the handle is shaped almost like a canoe, with a rounded pommel area leading to a gentle swell in the middle, and finally dipping in to a generous finger choil before rounding off to mirror the bottom. 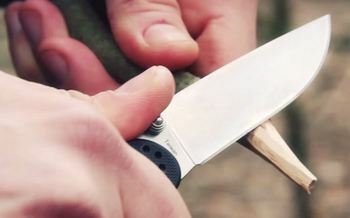 This knife feels so natural to hold in either of the standard forward grips, locking your index finger in place and putting your thumb directly on the fantastic gimping at the base of the blade’s spine. There’s no unnecessary flashy jimping or weird angles, just a beautifully rounded and perfectly comfortable handle that works, which is becoming a rarity. The RAT 1 and RAT 2 have something that I’ve never seen on another folding knife, two sets of washers. One set of bronze washers sit against the blade, and another set of nylon washers is sandwiched between those and the stainless steel handle scales. I have no idea why they thought to do that, but oh boy does it work. These knives are renowned for flicking out with super speed, and they deserve their reputation. They don’t require a drop of oil, a dab of grease, or an ounce of lubricant, yet you’d swear that someone dipped the knife in grease while you weren’t looking after you flick the blade out, it’s just that smooth. The lockup is also a point of excellence for this knife, thanks to the full stainless steel liners. I’ve owned at least 3 of this model, and each one had the same 50% engagement on the liner lock, with zero up and down play and virtually no wiggle side to side. It’s impressive when you realize the knife is barely 7″ overall, and weighs under 3 ounces. Have you ever seen a knife you just loved the design of, but hated the color? Well, that isn’t a problem when it comes to the Ontario RAT 2. Ontario produces at least five different color variations that I’ve seen, and even offers the blade in a black or satin finish. Hate knives that don’t offer you the type of carry option you want? Bam! Four-way positionable pocket clip! Did I mention they make both plain and combination blades? I love when a knife offers me the option to carry the thing how I want to carry it, without forcing me to compromise. You’re probably getting a better idea of why I bought so many of these things now! As far as fit & finish goes, I can say you definitely get more than you pay for with the RAT 2. Every one I’ve used has had that same great action, they’ve all come with very useable (if not scary sharp) edges, and I have yet to see an issue with the lockup. The most variance I’ve seen has been in the centering department. My first RAT 2 was dead center, but the two after that tended to drift to the non-locking side of the knife. They were never so far off center that the blade would rub the liner, but it was far enough that it irked me. Let’s be clear here, these knives are made in Taiwan, not in the U.S. Really though, that seems to have less bearing on knife quality these days than it has in the past, and if you don’t believe me, pick up a Spyderco that is made in Taiwan. Sure, we should always buy American when possible but for those on a budget it’s tough. I’ll admit it, I’ve been soft in the field test department at times, especially when it comes to smaller knives that have not-so-small price tags. You’ll be happy to know, thanks to the very small price tag of the RAT 2, I did not go gently on the testing department. After re-profiling the edge to about 20 degrees per side, I proceeded to do all the normal little daily tasks I expect of a smaller EDC; I cut a few veggies, made a sandwich, opened packages and mail, etc. When I had finished that, which the RAT 2 excelled at, I took a walk in my yard and started gathering dead branches, then proceeded to use a baton to split an assortment of the sticks ranging from 1 to about 3 inches thick. Once again the RAT 2 came through. So I decided to see how much I could do before this thing would finally give up. Using the same baton, I started whacking through about a five inch thick live oak branch. Well, the knife didn’t necessarily fail (the lock never disengaged, although it did end up pressed against the opposite liner), it just dulled so bad by this point that it couldn’t defeat the branch. So, there it is, the knife has limits after all. Luckily for the average user, you won’t find yourself batoning oak branches too often! As I said earlier, the RAT 2 is largely a scaled down version of the RAT 1 and you can see the size comparison below. There is one knife I simply must discuss as an alternative to the RAT 2, because it was designed by the same man to be a direct competitor! The ESEE Zancudo, designed by Jeff Randal after splitting with Ontario, is a similarly sized and priced alternative. Both sport 3″ drop point blades with a full flat grind, both made of AUS-8 steel. The Zancudo is a frame lock, which many folks would say is probably stronger than a liner lock (I’m not one of them, as a properly made liner lock is just as strong), and instead of a satin finished blade ESEE gives it a nice stonewash. When it comes to carry options, the RAT 2 is the clear victor, offering both lefties and righties both up and down configurations, whereas the Zancudo is only up or down for righties. I also much prefer the handle design of the RAT 2, both aesthetically and ergonomically, to the simpler bell curve of the Zancudo design. The Zancudo is just a bit slimmer than the RAT 2, but weighs a full half ounce more. The race between Randal’s first and second design may be a close one, but I’m calling it for the RAT 2! For a knife that packs as many cool features as this, into a package as small and lightweight as this, with a price tag as small as this one, is no easy feat. You’re getting a fantastically useful blade that’s a blast to flick out, a great ergonomic handle made with open pillar construction, and the ability to carry it however the heck you want. The Ontario RAT 2 sits firmly in my budget EDC hall of fame, alongside other great budget knives like the Spyderco Tenacious and Kershaw Skyline. I wish more companies out there would try to do what Ontario has clearly done here, make a no nonsense knife that anyone can afford and enjoy, without resorting to gimmicks or flashy marketing, just letting the knife and the quality speak for themselves. So do yourselves a favor folks, go check out the myriad of options available between the Ontario RAT 1 and RAT 2, because you can’t find much higher value for your dollar.